One of my favorite Spinsterhood-related books is Marjorie Hillis's Live Alone and Like It. Though the book is from the 1930s, I find a lot of the suggestions are still quite valid. Re: Breakfast in bed. While I don't have a maid to serve me breakfast in bed the way Hillis suggests, I find it's still enjoyable. When I lived in the Village, I ate my breakfast in bed because I wanted to avoid my roommate, and my bedroom was actually the size of my bed. Now, I do it by choice. Luxurious Choice. This morning, as ever morning, though, I'm doing it my own Spinster style by eating Brown Sugar and Cinnamon Pop Tarts off an amazing paper towel. You know, I like to keep it classy. But this way, more luxury: I don't have to do any dishes or load the dishwasher. 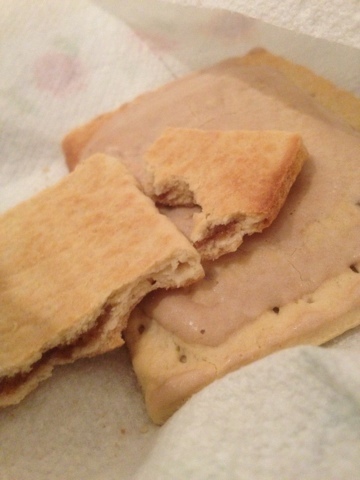 Last night when I got home from work at 10:30, I ate Pop Tarts off a paper towel for dinner, too. Since starting the new job, I've been putting in a minimum of a 60 hour week. I assume this is mostly because I'm new and still getting my bearings, but the other night I found myself being chided by a (senior) coworker. Saying I should ask for a freelancer or some help, the lovely petite lady was concerned for me. "Don't you want to go out or watch TV or...have a baby?" While the third item in that list seemed to be the one that didn't belong, I suppose she was speaking to one of the main reasons for my spinsterhood. And, unfortunately, the reason my thighs look like their made of oatmeal. I know, delicious. Well, now that Pop tart time has ended, I shall take myself and my oversized cat shirt to wash my face.